Since this was my very first exhibit ever I would like feedback on mine. I enjoyed this very much. I had originally planned on doing a lighthouse one and then a friend of mine sent me the link to this poem and I loved it. Janet your presentation was really well done. I really enjoyed looking at your exhibit. You did a really good job and congratulations. For your first exhibit of any kind you certainly did an outstanding job. It is extremely neat and tidy and pleasing to the eye. I can see how you planned it out and organized your dragons. I would, however, like to see a few more stamps. The stamps you did use fit the bill. I also wished you could have found more than just three countries for your representation. I am not familiar with the poem "Sunset Bronze Dragon." Probably because it does not fall into the Gordon Lee classification of a poem. A poem, in my book, needs to rhyme. This poem does not. That's just the kind of poet that I am. Luckily, I only deducted a few points. 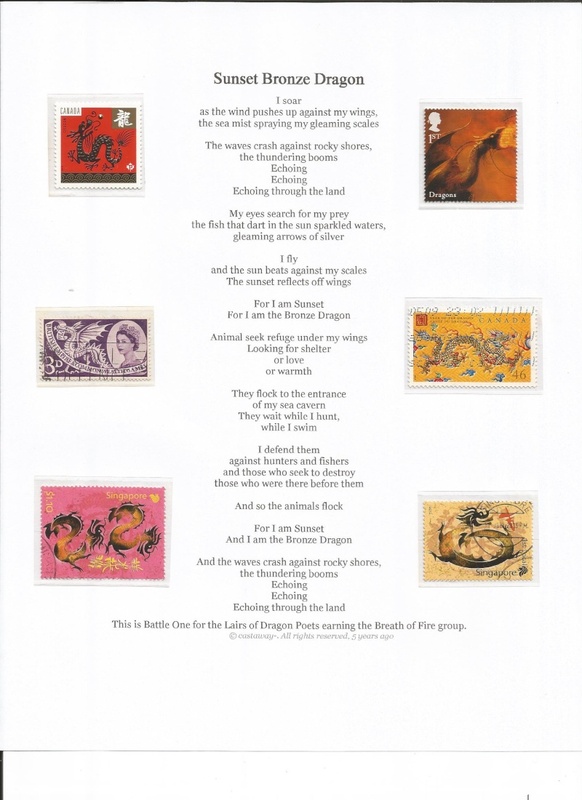 But in a stamp/poem exhibition I would expect stamps and a real poem. The stamps represented are unidentified. Too bad. You have plenty of space to at least include the date of issue, if at least an ID number. It's a good thing your over-all exhibit is good looking and your subject is dragons. I think that is the only reason I voted for it. Thank you alyn and Gordon Lee. Gordon, I like your rules of viewing. I agree with you that it probably did need more stamps. I thought about that after it was done and posted. And next time I will add information about the stamps. Thank you for your feedback.